When Sidney Crosby slipped a wrist-shot past USA netminder Ryan Miller 7:40 into overtime on Sunday night, he not only sent an entire nation into a patriotic frenzy, but he also concluded what many are calling the best international hockey tournament that has ever been staged. Canada, the United States and Finland will leave Vancouver with medals, but the play of all the nations involved was world-class and the Olympic stage proved, once again, to be the perfect platform for NHLPA members to showcase their skills, camaraderie and love of country to millions of fans all around the globe. There were many amazing player performances and hockey moments that all fans will remember from the Vancouver Olympic hockey tournament and NHLPA.com has compiled a list of some of these highlights for your consumption below. Three teams left Vancouver with medals for their troubles, but there were several players who accomplished feats that will have their names in Olympic record books for many years. Playing in his fifth Olympic Games, Teemu Selanne had another fabulous tournament to put a cap on his international career. The ageless Finn won a bronze, the third medal of his Olympic career, and set the all-time scoring mark in the history of Olympic hockey. An assist on a Kimmo Timonen power-play goal against Germany gave Teemu a record 37 points, eclipsing the 36 of the Soviet Union's Valeri Kharlamov, Vlastimil Bubnik of Czechoslovakia and Canadian Harry Watson. Chris Pronger may have won his 2nd gold medal in four attempts, but his participation in the gold medal game was the 25th Olympic match in his career, giving him the all-time Canadian record. The 35-year old native of Dryden, ON passed Wally Schreiber on Canada's list for games played in the Olympics, donning the ‘Maple Leaf' in Nagano ('98), Salt Lake City('02), Turin ('06) and Vancouver ('10). Stellar performances by American goaltender Ryan Miller became the norm by tournament's end and the accumulation of his terrific games put him into the United States record books. Jim Craig, the man between the pipes for the “Miracle on Ice” had a 2.14 GAA in the classic 1980 tournament, but Ryan smashed that number, only allowing 1.35 goals-against in his six games, an overall performance that saw him named tournament MVP by the media covering the event. Apart from Ryan Miller's MVP performance, there were several goalies who provided their teams with excellent chances to win games and advance further than many had anticipated. Jonas Hiller, of the Anaheim Ducks, was the top Swiss player for the tournament, as he provided elite-level goaltending to a team that knows how to win in tight-scoring games. Slovakia came a whisker away from winning their country's first medal in hockey and saw many great performances from many of its players, but, without Montreal's Jaroslav Halak, a fourth-place finish for the Slovaks would have been improbable. The young netminder played in each of Slovakia's games, defeating the powerful Russians and Swedes along the way, and registering a 2.41 goals against average and a .904 save percentage, helping his country to their best-ever Olympic finish. Finally, if there was a performance that embodied a goaltender's ability to cope with pressure and persevere, then Roberto Luongo's was surely that. He kicked off Canada's Olympics by shutting out the Norwegians and then watched Martin Brodeur play the rest of the qualifying round. A loss to the Americans chased Brodeur from his starting job and left the Canadians with zero margin of error going forward, needing four straight wins to capture the gold medal. With the weight of the country on his shoulders, Roberto hung tough long enough to have it replaced by the weight of gold around his neck. While veteran players such as Slovakia's Pavol Demitra and Canada's Scott Niedermayer were able to turn in virtuoso performances in what may be their final Olympics, several Olympic rookies had exceptional tournaments in what will certainly not be their last chance to shine on the international stage. Team Canada's Jonathan Toews is a prime example of one of these players. Named to the all-tournament team with Ryan Miller, Brian Rafalski, Shea Weber, Zach Parise and Demitra, Toews, the 21-year old captain of the Blackhawks, had a performance for the ages. 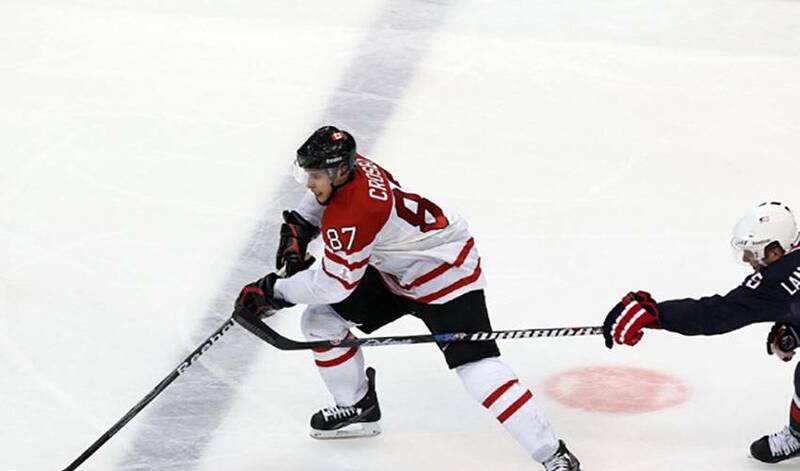 Jonathan led Team Canada in scoring with a goal (the first in the gold medal game) and seven assists, while consistently playing against the opposition's top line, taking important face-offs and seeing time on the penalty-kill. The Winnipeg, MB native's play did not go unnoticed by the hockey scribes covering the Games as Jonathan was named the top forward of the tournament as well. Toews' NHL teammate Patrick Kane had a dynamic Olympic debut as well, as he provided his American team with speed, scoring and all-around offensive flair. Impressive young defenceman were also in high supply in Vancouver, with Canada's Drew Doughty, Latvia's Oskars Bartulis and Switzerland's Luca Sbisa serving as top players for each of their teams. The 2010 Vancouver Olympic hockey tournament proved again that there are no ‘easy' games on the schedule anymore at the top-international level. Most of the games contested were close affairs and, as is always the case in a gathering of the top teams in the world, there were some surprises and upsets. Had Slovakia held off Finland in the bronze-medal game, they would have gone down as one the all-time great Cinderella teams, having beaten super-powers Russia and Sweden. Canada was on both the receiving and giving ends of a surprising result, having suffered a 5-3 loss at the hands of the Americans on the final day of the preliminary rounds, which they followed up by crushing Russia, 7-3, in a game that everyone expected to be close. It was the young American team that provided the surprise of the tournament though. Their brilliant 5-3 win stunned and an entire nation, and provided a new generation of American players a lasting memory and proved that they belonged both, in the tournament, and in the debate of great hockey countries. So, with the tournament complete and the party over, the players from all 12 countries are heading back to their NHL clubs to resume their push for the playoffs and the goal of winning the 2010 Stanley Cup. For now, Canadian hockey fans will relish in the accomplishment of coming out on top of the 2010 Olympic tournament and capturing the coveted gold medal on home soil. With the 2014 Olympic Games in Sochi, Russia still four years away, the world's other hockey powers will have a long wait to get a chance to take the gold medal away from Canada.